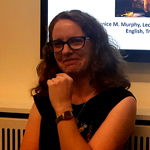 Bernice M. Murphy is an Assistant Professor and lecturer in Popular Literature in the School of English, Trinity College, Dublin. She has published extensively on topics related to horror fiction and film, with a focus on representations of place and space. Her books include The Suburban Gothic in American Popular Culture (2009), The Rural Gothic: Backwoods Horror and Terror in the Wilderness (2013), The Highway Horror Film (2014) and (with Stephen Matterson) the 2018 edited collection Twenty-First Century Popular Fiction. She is the co-founder of the online Irish Journal of Gothic and Horror Studies and is a founding member of the recently established Irish Network for Gothic Studies (INGS). Her current work in progress is a book on the relationship between California and the gothic genre.